We do not speak of that time when I confused oil and vinegar. It was...unpleasant. One of the great things about student life - or at least, what student life was like when I was part of it, a few months and a million years ago - is the opportunity to find out just what your parents were doing when they managed to produce meals every evening. It truly seems like such magic and mysticism. All these ingredients went in...but what came out was something entirely different. It will not surprise you to learn that, rather than teaching myself practical and nutritious cookery, I was firmly in the "experimental" camp. Unless at least one person walks into the kitchen, stops dead and says "WHAT are you doing? ", you're clearly doing something wrong. So, here's one of my favourite creations. Do not attempt this recipe if your family has a history of heart problems. In fact, you're probably better off not trying it at all. Heat a drizzle of oil in a large frying pan. Add the onion and the curry powder, and fry until just starting to brown. Push the onion to one side, and place one of the slices of bread in the pan. Fry it until its underside is golden brown. Flip the bread and fry the other side. Remove the bread, and replace it with the other slice. Fry one side. Flip the second slice over, and while its other side is frying, put the cheese on top of it and let it melt. When the cheese has melted, scoop the onion back on top of it, and top it off with the first slice of bread. Serve hot, with a paramedic on standby. The onion is fried, the bread is fried, and the entire sandwich has been fried. It's not extravagant in terms of ingredients, but man does it taste good. I can accept no responsibility if you (a) fall down dead, (b) lose your girl/boyfriend, (c) require a heart bypass or (d) burst into tears of joy after eating this sandwich. Well, maybe except the tears of joy one. That was entirely my fault. For some reason, marketing companies have had difficulty putting "the real meaning of Easter" on a card. Funny, that. Jesus made it abundantly obvious that pain and difficulties were part and parcel of being a Christian. That became most obvious on the day we're currently remembering, Good Friday, when he was executed by the Romans. In case you've forgotten, that execution was in the most humiliating and painful way the Romans could dream up, and given that we're talking about a culture which spiced up its theatres by killing people on stage, that's no small statement. Jesus showed in the clearest possible way precisely what his followers were letting themselves in for. Paul picked up the theme in his letters, as did Peter. (References to some examples are here, here, here, here and here, if you're interested.) If that wasn't enough, Revelation is almost entirely about the horrible things that are going to happen to Christians in the end times. Unfortunately, it's so full of metaphor and imagery that quite what those horrible things are going to be is anyone's guess. Fortunately, that wasn't the point of the book, which was much more about the fact that the suffering does eventually end. Taken with the notoriously blood-drenched Old Testament, you might think that Christians are so focused on the bad things that might happen to them that they don't pay any attention to what is actually happening. That, however, is not the case. Yes, the Bible does tell us about terrible things, but that's because terrible things happen. It gives us an explanation for them, tells us what to do to cope with them, and exhorts us to prevent them from happening to other people. There are literally hundreds of Bible verses covering justice for the poor, social responsibility, care for the disadvantaged, and an overwhelmingly pervasive sense that God cares about the problems and wants to help us. When Jesus told people that if they followed him, they were opening themselves up to a world of pain, it really wasn't one of the greatest advertising pitches in history. "Roll up, roll up! Get executed in a number of pointy and painful ways!" He didn't promise riches, or fame, or power, or authority. Neither, it's important to note, did he promise comfort, tranquillity or fellowship, although they are often present too. That's why I get annoyed with people who say "you should become a Christian/Muslim/Buddhist/Pastafarian because you will feel better" or "because you will have peace". None of the things that a religion can give you are worth anything unless the claims of that religion are actually true. That was the one reason to follow Christ back in the first century, and it's the only reason now. He certainly believed that what he said was true. That's why, 2000-odd years ago, he was nailed to a piece of wood, and that's why we still remember it on Good Friday. RISC OS didn't use menu bars, for the record. Anyone else remember RISC OS? Microsoft do sometimes get an unnecessarily bad rap when it comes to software. Although it's fashionable to say that they're evil, in it for the money and technically incompetent - and Clippy does make you wonder - they have produced some superb work. Excel, for instance, is one of the most useful products on the market, and is particularly notable in that its open-source alternatives are just not that good when it comes to advanced features. In fact, Microsoft has made quite a few very good products, and I still use some of them. 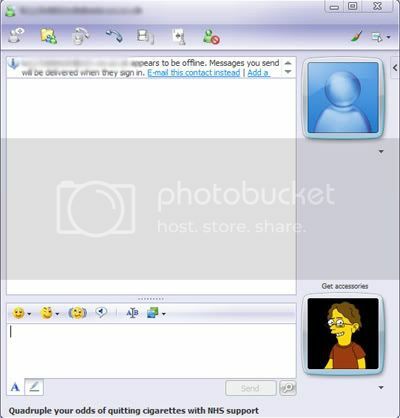 MSN Messenger (sorry, "Windows Live Messenger") is one of them, used because Pidgin doesn't support webcam chats, voice chats or handwriting. Gimmicks, certainly, but they are fun gimmicks and I see no point in moving away from them just yet. The other thing that Microsoft does very well is maintaining a consistent style. This style isn't always very attractive - almost the first thing that I did when I got the (XP-running) laptop that I'm currently using was to switch off the garish, jellybean-coloured theme and use the Windows 2000 one instead. There's just something classy about blue window title bars and grey buttons, an impression that I've had because Microsoft has stayed with that style since Windows 95 came out. Despite XP trying to foist its jolly colours on me, it does at least give me the option of turning them off. This brings us back to Windows Live Messenger, because a few days ago I installed its latest update. The update doesn't actually change very much in terms of functionality, but it does one thing that Windows Media Player 11 did before it. See if you can spot it. ...and this is the updated version. Yes, the only major difference (apart from that dashing young gentleman in the updated version) is the change in the style of the buttons up in the top right. Now, I'm aware that the buttons in the older version aren't in the standard Windows style. However, they are roughly the same size as the standard, and the icons are so similar that it still fits in with any XP theme. I didn't realise that the new buttons were significant until I compared them with the ones in Windows Media Player 11. The design is exactly the same in that program, which tipped me off to it being a wider phenomenon. And then, of course, I saw a computer running Vista. It's not a new theme that two programs happened to use, it's the standard Vista theme. Which is being pushed onto XP customers. In other words, they are deliberately breaking some of XP's functionality (style consistency) in order to make people want to switch to Vista. I would say that this is one of the worst decisions that Microsoft has ever made, except that recently they have come up with some even worse ones. Internet Explorer 7, for example (which I avoided by not downloading the automatic update - seriously, who delivers an entire browser through their security patching system? ), has a good try at hiding the menu bar. 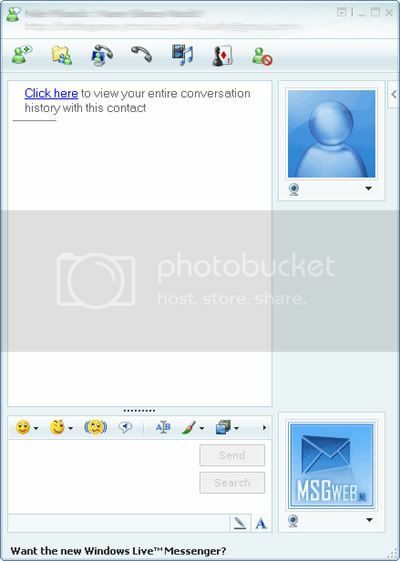 Windows Live Messenger does the same, but that's less noticeable as you hardly ever use the menus. And so does the latest version of Office, exchanging the menus and toolbars for an unholy blend of the two. It may not sound like a big deal to get rid of the menu bar. But step back for a second and consider that, ever since the invention of graphical user interfaces, menus have been right there. Windows version one had a menu bar. It's not just Microsoft, either - Apple used them, the X Window System (the GUI for most Unix-like systems) uses them. Personally speaking, it is practically hardwired into my brain that if I want to open a file, I go up to the "File" menu at the top left. In short, changing the user interface this much is a massive "SCREW YOU" to all the users who have stuck with Windows since its invention, as well as tacit confirmation that Microsoft couldn't care less about attracting Apple's customers or users of other operating systems. It is the most staggeringly bad software decision they have ever made, and has further convinced me never to get Vista. Ah, so that's how you pronounce "dog". I've always wondered. A very image-heavy post for you today, so I'm going to be kind and stick the whole lot behind a cut. All of these images are courtesy of a woman who lives just down the street from me. She's 92, and has lived in the same village all her life, which doesn't mean a lot to me until I realise that she's lived through at least part of both World Wars, and that when she was born there was no such thing as space travel, television (except in an experimental form), global communications, transistors, turbojet aircraft, helicopters (again, except experimentally) and who knows how many other things. 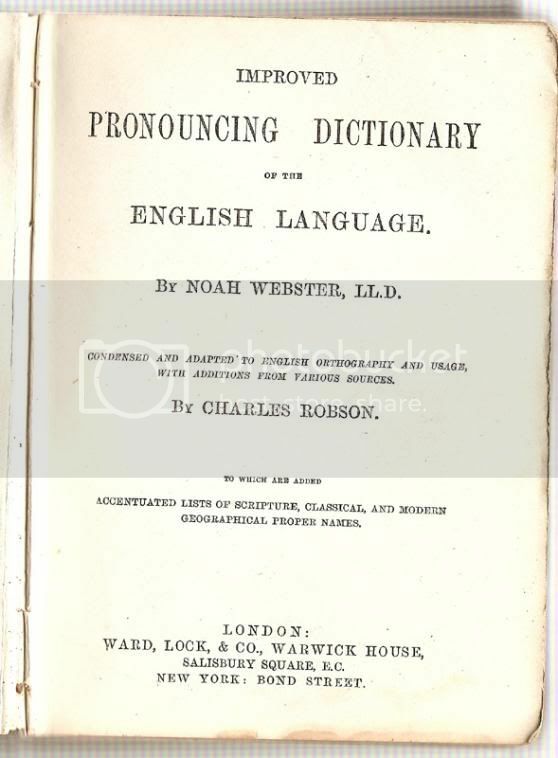 Anyway, recently she gave my family a pile of old books, one of which - Webster's Improved Pronouncing Dictionary of the English Language - I liked so much that I've scanned a couple of bits. This is the front cover (all pictures are links to larger versions of themselves, by the way). I love the design here. In a way, it's very simple (text and a few lines), yet the detail just goes crazy. Making The Initial Letters Slightly Larger Than The Following Ones is a lovely touch too. 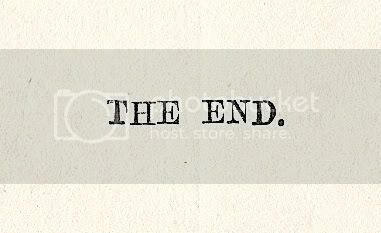 The title page is even simpler, yet still manages to be remarkably classy. The range of font sizes is huge, and it's amazing how just putting full stops after every heading immediately makes you want to read it out in an old-time radio voice. 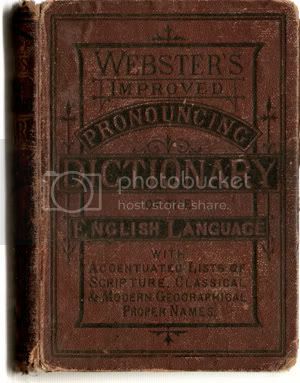 By the way, inside the front cover is an inscription from the original owner of the dictionary - it was given to its first recipient in August 1885. 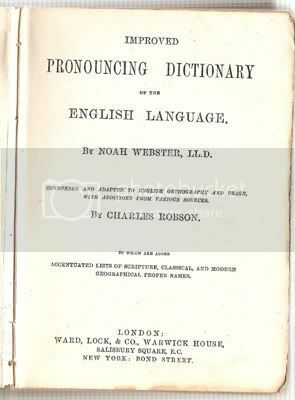 I'm skipping the dictionary's actual content because, come on, it's a dictionary, there's not going to be much you haven't seen before. Oh, except that there's a rather nifty key to the phonetic symbols running along the bottom of every page. That photographic style is either very arty or is just proof that I couldn't be bothered to switch the scanner back on or dig out my tripod. You choose! 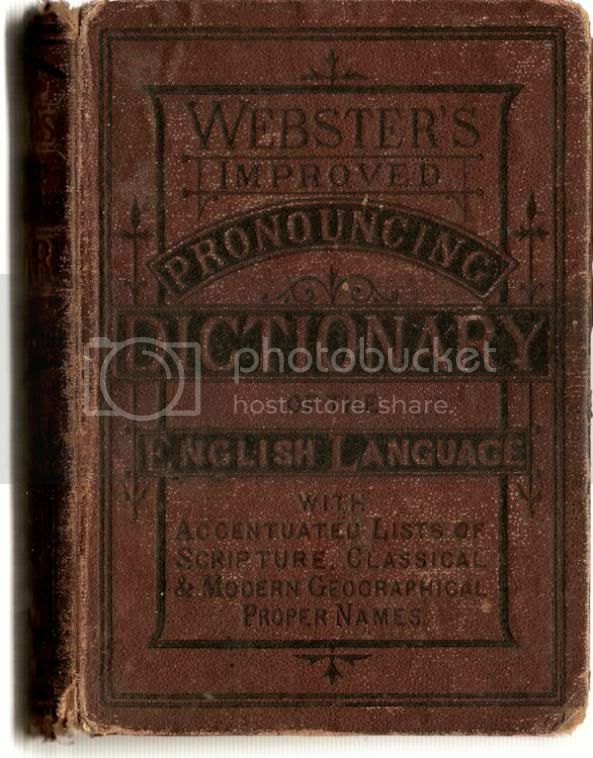 At the back of the dictionary we've got an advert for more books of knowledge. What I find fascinating about this is that by modern standards, the design is an absolute trainwreck. 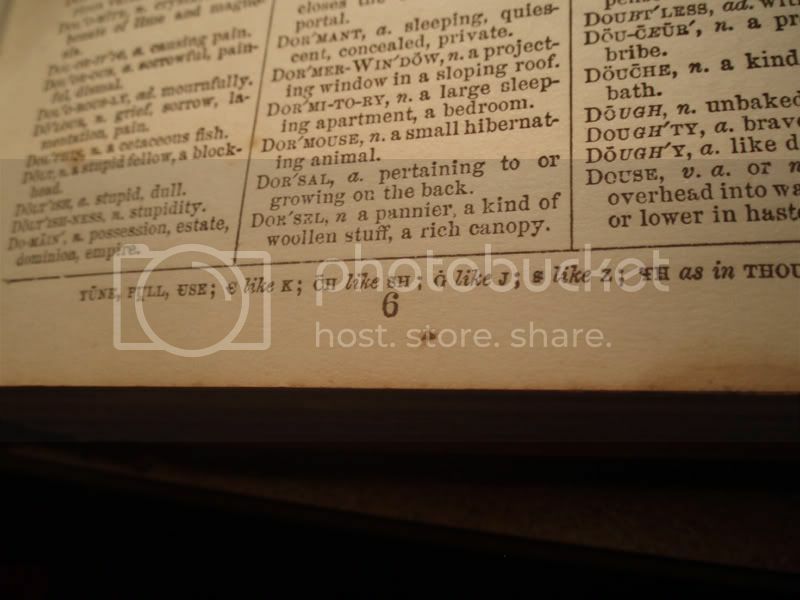 I think I can see four different fonts, in a vast range of sizes, with huge dense blocks of text in a tiny size. 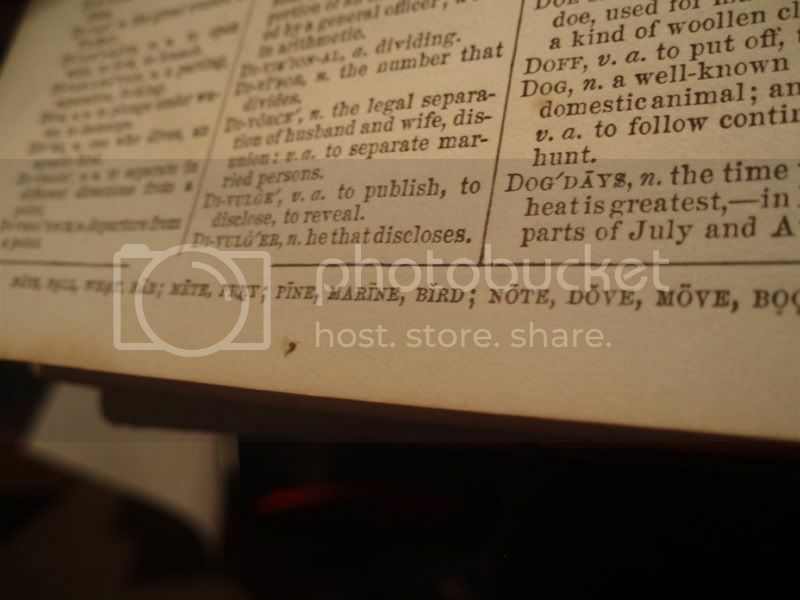 Various words are picked out by unexpectedly changing the font size and Putting Capital Letters on words. In short, it's a mess. 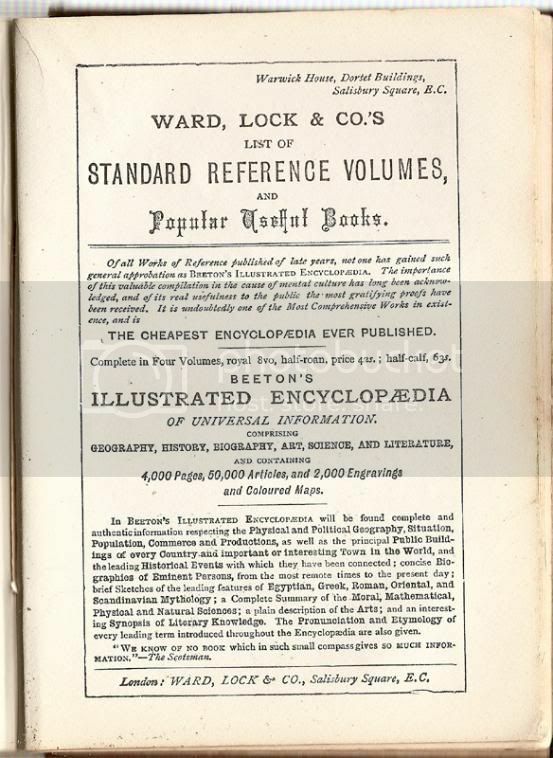 But somehow, it still makes me want to go and buy a Beeton's Encyclopædia. 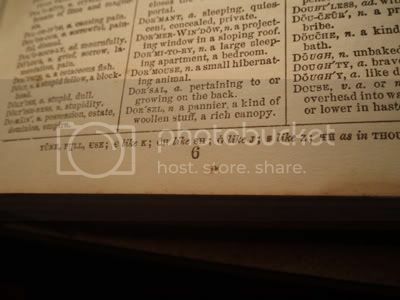 Although this dictionary isn't worth a whole lot (you can see for yourself the kind of condition it's in, apart from anything else), I think it's fantastic to have little parts of the past kicking around like this. It serves as a reminder of a time when information was much harder to find than it is today, and therefore more valuable - in a world where everything you type is automatically checked for spelling and cross-referenced to dictionaries (American ones in my case - I really need to get around to installing those extra dictionaries on Firefox) there's just no need for something like this. 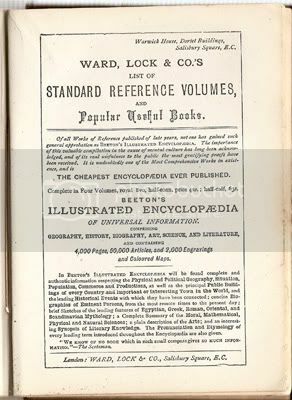 It's possible that having so much information available to us has devalued it; we need old objects like this to remind us that one day it could all be gone. Oh, and quite apart from all the deep philosophical points, how can you not love a dictionary that ends like this? "Kissing the Blarney Stone" doesn't sound very hygienic. Happy St. Patrick's Day! This festival isn't as big a celebration in the UK as it is in Ireland (or, indeed, America, a place where "Irish ancestry" can actually mean "quite likes U2"). Having been at war with the Irish on and off for several centuries can do that. Nevertheless, the British public never give up a chance to get horribly drunk and then blame someone else - an entire country, in this case. With that in mind, I thought it would be a good idea to snoop around a bit for some suitable music to play while you can still stand reasonably upright. This is a lovely, plinky little acoustic number. Not particularly threatening or raucous, it's just plain happiness wrapped in an Irish veneer. Nicely performed, too - oh, and it can be freely downloaded and shared thanks to its Creative Commons licensing. Turlough O'Carolan was a contemporary of Bach, so this is a pretty old tune. It's a great example of the use of the harp in Irish music, a tradition that's sadly been largely eclipsed by the use of mandolins and bouzoukis. This particular song isn't usually performed as slowly and gently as in this case, so it makes for a relaxing wind-down. Possibly between drinks. I've known this song for a while now, as my dad used to play it in his Irish band - which, coincidentally, was called Shenanigan. (Not this one. I'm not Canadian. Although I have been mistaken for an Australian before.) It's a classic tale of love, or at least of mostly-controlled lust, that dates back to at least the 18th century. This performance is catchy enough to dance to, and I love the lead singer's beer-and-cigarette-laden voice. Yeah, two from the same band seems a little lazy, but I wanted to include this one anyway. No words apart from the odd "Hey! ", just high-speed playing and an electric atmosphere. The bodhrán that introduces the song is an interesting instrument - according to Wikipedia it has its roots in war drums, and you can just imagine it leading the troops as they march off to fight...well, the English, probably. Anyway, it drives the song brilliantly, and if you're anything like me you'll need a bit of a sit down afterwards. There's a whole heap more music out there on the web that's appropriate for today, and actually for any occasion - it's just a matter of knowing where to look. Of course, don't overlook the established musicians either, as they're capable of rocking extremely hard. To illustrate this point, I'll leave you with perhaps the finest example of Americans "doing" Irish music - Steve Earle's song "Galway Girl". This video is not released under my CC licence. You know the drill. You young kids with your so-called "violent" lyrics. I bet you've never shot a man in Reno, just to watch him die. Generally speaking, music-making is a pretty egalitarian business. If you've created a song, it doesn't matter much who actually performs it, so long as they're talented enough. Content isn't much of a barrier - Bob Dylan takes on the persona of a middle-aged miner's wife in "North Country Blues", for example, and because his lyrics are so strong no-one really bats an eyelid. Similarly, cover versions of songs tend to work because they don't "belong" to particular artists. Indeed, cover versions sometimes enter the public consciousness far more than the originals - it took me quite a while to realise that The Who weren't the original writers of "Summertime Blues", because they rock out so well when performing it. Sometimes, though, particular artists put their stamp so very firmly onto a song that it's impossible to imagine anyone other than that artist performing it. Jeff Buckley's "Hallelujah" gets pretty near, having been played so much that it's almost entirely eclipsed the original Leonard Cohen version. An even better example, though - probably the epitome of this phenomenon - is Johnny Cash's cover version of Nine Inch Nails' "Hurt". The album on which Cash's version of "Hurt" appears - American IV - The Man Comes Around - is one of the last he recorded, aged 70, before his death in 2003. Like the others in his American series, it's a fairly quiet album, full of reflective songs. It's a very simple, stripped-down sound, of the kind which can only possibly work if the voice of the person singing has enough character to carry it off. Well, Cash had that character when he was 25, and it only grew over the years. By the time of the American series recordings, although clearly the same deep, rich voice that had boomed out throughout his career, it was weaker, more vulnerable. "Hurt" was never a happy song. The lyrics are, in fact, unremittingly bleak, containing a horribly detailed description of the song's protagonist mainlining heroin, a remembrance of a life full of lies and disappointments, crushing loneliness, and a feeling that life produces nothing of value (an "empire of dirt", as the chorus says). Indeed, Nine Inch Nails' frontman Trent Reznor wasn't too thrilled with the idea of allowing his song to be covered by the man who had built most of his songs around a "boom-chick-a-boom" rhythm, considering the idea of the cover "a bit gimmicky". However, the combination of Cash's elderly voice and some of the most depressing lyrics in musical history works incredibly well. "Hurt" received extensive airplay when it was released in 2002, so I'm not about to describe it again here. I will say, though, that it is a fantastic rendition. Cash conveyed the loneliness of the lyrics perfectly, and sadness comes from every word without ever spilling into sentimentality. This, in itself, wouldn't make it indelibly a Cash song - there are several singers who can pull off the same kind of performance. The key is that Cash was a unique man, who had done things that no-one alive can conceivably claim to have done. Consider, for a minute, the fact that Cash toured with Elvis in his younger days. He was right there at the birth of rock'n'roll. You think your Beatles collection is old? Cash's first album came out six years before Please Please Me. The Beatles released 24 albums and EPs; Cash released 83. All the bands that you know and love, except for those that began in the last six years, were founded during his recording career, and you can bet that they were influenced by him in some way. He had unmatched credibility among the American working class. Try to imagine almost any modern rap star performing in a prison without getting stabbed. Now go and listen to At Folsom Prison, with its background of clanks and rattles as the business of the prison goes on around the band, and listen to the raucous and enthusiastic reception that Cash gets. That credibility was due, in large part, to Cash's imprisonment history. Despite the fact that he clearly milked it for all it was worth, it's still true that he was held by the cops at least seven times, and his addiction to painkillers and amphetamines is well known. Cash's image as a hellraiser was pretty accurate, and he remains the only man who was able to wear all black - just because he liked it - and not look like at least a bit of a poser. In short, Cash's life meant that he was uniquely placed to sing "Hurt". Those years of drug abuse, of practically destroying his life, come through in every wobbly syllable of the song. When he protests that getting close to him will result in pain, it's not a vicious warning; he conveys a weary realisation, borne out by long experience. If anyone else were to record "Hurt" now, not only could it never measure up, it would instantly be seen as a shameless attempt to cash in, and would be buried without trace. There is simply no-one alive with the experience or the character who could do justice to it. This means that there is only one man left alive who can sing the song at all, and that's Trent Reznor (who gets away with it solely because he wrote the damn thing). Even he considers Cash's version better, saying in an interview "I just lost my girlfriend, because that song isn't mine anymore." Is that a bad thing? Should we treat all songs equally, regardless of prior performances? In this case, no. Cash achieved something extremely rare - not only did he make a cover version that improved on the original, he got so near to perfection with it that other attempts are doomed to fail. That is an incredible cap to an unsurpassed legacy, and I think it can be left there, a fitting epitaph to an amazing man. On the minus side, the channel does have a stunning lack of Steven Seagal. Having been pretty much entirely ignorant of politics for most of my life (with the minor exception of the fuss my secondary school made over the 1997 General Election, which only really caught my interest because it let me annoy one of my extremely conservative friends by making incendiary left-wing remarks), I've rather surprised myself by suddenly becoming extremely interested in BBC Parliament. Our Freeview box was second-hand when we got it, and I live in a very poor digital TV reception area anyway. Rumour has it that the signal would be stronger, except that it would then interfere with the Belgian police's transmissions. Surely the only time in the history of the world that anyone has said "we can't do that, it'll annoy the Belgian police", but I digress. The practical effect is that we have very few channels available, so when I'm flicking through them late at night I generally have to choose between Five US (CSI, House and Num3ers on a constant loop), BBC FOUR (worthy but frequently rather dull), bid-tv (saps my will to live) and BBC Parliament. Although that makes it sound like watching it is nothing more than making the best of a bad job, the channel is also bizarrely compelling. It's very refreshing to watch a channel that has no continuity announcers, no trailers, barely any credits, barely any presenters, and between programmes nothing but a card telling the viewers what's coming up next. It's very reminiscent of watching recorded educational shows from BBC 2 in primary school - anyone else remember the coloured "TWO" logo and the little digital clock counting down in the corner? Image owned and hosted by the terrifyingly-detailed BBC Logo Gallery. Go and have a nostalgic browse. If that wasn't enough, the content of the channel is also very good. It's surprising, really, as the viewing figures must be absolutely tiny. Nevertheless, the amount of information that the editors put together is fantastic - during debates, not only is the name, party and constituency of the current speaker put on screen, but useful facts that help the viewer to understand the current topic also appear. When you consider that getting assigned to work on BBC Parliament must surely be only one rung up the ladder from being assigned to Ceefax nowadays, that's impressive commitment. Regardless of its content, the channel also scores highly with me because it's available as a free online stream. You can get it from the BBC website, or through the really rather good (although possibly questionably legal) wwiTV service (click here for the direct Windows Media stream). In today's environment, where surveillance is becoming ever more widespread, it is vital that politicians be kept accountable. Allowing anyone across the country to watch them at work is an excellent way of doing that, and also helps to give lie to the perception that they're all corrupt and in it for the money and power. Watching a small bunch of bedraggled politicians debating an issue late at night, clearly for no reason other than this should be discussed by Parliament, gives you a lot of hope for the future of the country. I very much doubt that BBC Parliament is ever really going to take off in the way that TV channels usually do. However, that's one of the best things about the BBC. Regardless of viewing figures, regardless of economics, they produce this channel because it's a channel that should be produced. Even if it's not very entertaining (although it does frequently feature Boris Johnson), it's good stuff. I suspect I'll be filling in a few late-night minutes there for some time. There's been some moral outrage in the press recently about whether today's rock stars are glamorising drug culture. Given that this has been sparked by press coverage of people like Pete Doherty and Amy Winehouse, and that one glance at either of those people should be more effective than any possible anti-drugs public service film, this seems a little strange. Anyway, it's certainly something that the press can get their teeth into, and it's definitely a good excuse for certain types of journalist to decry today's culture and long for a return to the good old days, when men were men, truth was truth, films were black and white, women were expected to stay in the kitchen and black people couldn't vote. Ah, what a golden age that was. Even if we ignore the fact that the time nostalgically longed for was pretty rubbish in a number of ways, that still wilfully ignores the content of the music that was around. And this brings us to today's Public Domain Theatre, brought to you by the amazing resources of archive.org. I don't know how they manage to keep running, but the archive.org people are doing a fantastic job of keeping vast quantities of our culture accessible. The song that I'll be serving up from their vaults is "Dope Head Blues", by Victoria Spivey. Awesome though archive.org are, their servers can be a touch slow. You may want to click Play and then immediately pause the track to let it load, so that it doesn't stop all the time. Spivey was one of the classic female blues singers, and worked with some extremely famous people, including Louis Armstrong, Bob Dylan and Lonnie Johnson, who plays guitar on this recording. Her fame certainly gave her the opportunity to indulge in the kind of excesses that this song mentions, although whether or not she actually did is unknown. Either way, this song neither actively promotes nor condemns cocaine use. It simply presents, unvarnished, the damage that the drug does while still conveying the mindless enjoyment of its users. Look at the third verse, for example. In just a couple of lines, we find out that the singer feels invincible, but is actually on the verge of death. That's some serious economy of words going on, and it has the added bonus of being utterly chilling. Of course, you can't keep on being gloomy throughout an entire song without your listeners getting bored, which probably explains the inclusion of the gloriously surreal lines "The president sent for me / The Prince of Wales is on my trail." Even then, the comedy comes from the ludicrous extremes of the singer's paranoia - she's clearly breaking down mentally as well as physically. Obviously, this is an immensely depressing song. I think it's an important one, though, because it tells nothing but the truth. Anyone who wants the art they make to have a message can't do better than simply making it describe the world accurately, and letting the artwork's viewers or listeners draw their own conclusions. Spivey does this superbly. Forget Doherty and Winehouse, frankly...I think I'll stick with this. We haven't had a long self-righteous essay on here for a while, have we? There's a fairly major trend within film and TV, among other media, to glorify the concept of the vigilante, the man (or woman) who has to step outside the law to deliver Justice™ to the masses. Just last night, for example, ITV served up the latest US crime drama import, Dexter. Although this show does share some characteristics with the other procedural dramas (CSI, to name but three), its major difference is that it isn't a procedural drama at all. Instead, it's completely character-driven. Specifically, it's driven by the extremely creepy blood pattern analyst/serial killer of the title, who narrates every scene as an internal monologue. I'm not going to dispute that Dexter makes for some pretty good TV. Michael C. Hall does an excellent job in the central role, and looks just baby-faced and innocent enough to convince us that he really is capable of doing horrible things with cleavers to the victims duct-taped to the table in his garage. Working with Dexter's lack of emotion - and seeing where that leads him, in his work and personal relationships - is a really interesting idea, and turns what could be a cheap shock tactic into a three-dimensional character. Despite all of this, though, we keep coming back and running into the central premise that this man is brutally murdering a different person each episode. Even if his actions aren't explicitly condoned by the storylines, they're certainly neither condemned nor likely to be stopped any time soon (it brings in the viewers, after all). This is worrying, because this concept - that sometimes the rules have to be broken to provide justice - is both extremely appealing and extremely dangerous. Imagine, for a moment, a situation in which the police don't have to get a search warrant before they break into your house and look for evidence that you've committed a crime. In fact, you don't have to imagine it, because it's already happened and continues to happen in a number of countries around the world. Stalinist Russia and Communist China come to mind immediately, and there are many more examples. In short, procedures such as search warrants are there to protect the public, because they bring transparency, judicial oversight and accountability to the authorities. Once you accept that this sort of rule has to be in place, it becomes obvious why it isn't acceptable to subvert them, even for minor infractions - that man who is "obviously" guilty and "got off on a technicality" must be released if the rules weren't followed, because anything you do in the legal system creates a precedent. If he gets convicted anyway, it is suddenly much, much easier for a corrupt police officer to get anyone he wants convicted of any crime. The counter-argument to this is that there are hardly any corrupt police officers. That's true, thank goodness. Consider, though, that a single police officer may handle thousands of cases in a career. The consequences of their actions could be so vast, even if the risk is low, that it is well worth putting apparently over-the-top safety procedures in place. The same argument can be applied to those who complain about the "nanny state", one of my least favourite phrases in the English language. The sale of firearms is heavily restricted, for example, not so that the government can stop us all from having any fun, but because the consequences of one person having a gun who shouldn't have could be incredibly serious. It's the same with speed limits, health and safety at work, and any number of other measures. Essentially, then, to suggest that sometimes we have to "go outside the law" - a nice way of saying "flagrantly and deliberately break the law" - not only weakens the legal structure, it also makes us less safe. If you disagree with a legal decision, appeal against it. If you disagree with a law, campaign for its repeal. Direct action should be reserved for very, very few occasions, when the entire structure is so badly wrong that these legal pathways are simply unavailable. If your complaint with the law is on a lesser level than, say, slavery or apartheid, direct action is not the way forward. So why does this storyline get so much traction in TV and films? Not only is it already overused, it also tends to lead to extremely depressing stories. Take, for example, the 2004 film The Punisher (also on TV last night). Forgetting, for a moment, the casual sadistic violence, the atrocious acting, the poor excuse for a script and the lack of any furious kung-fu battles which might at least add some fun to it, the entire idea of the story was unremittingly bleak. Towards the end, our square-jawed American hero delivers the following line to his main adversary (this is absolutely word-for-word). "Made you kill your best friend. Made you kill your wife. And now I've killed you." Good grief, man. Rubbing salt into the wound much? Our hero doesn't even get any form of closure from this act - he's so depressed by the endless killing that he gets within a couple of seconds of shooting himself as well. Now, I'm sorry, but that's not a story about a hero battling against the odds, that's a story about a mass murderer who's killing people for no apparent reason other than that "they needed killing". There's no redemption, no balance, not even any sense of justice - just a huge heap of dead bodies. To be honest, then, I don't know why this type of story is popular. I do know, however, that it's already starting to be seen in real life as well. Consider the situation over in Guantánamo Bay, where an entire camp of prisoners has been locked up in clear contravention of the Geneva Conventions because they're actually "illegal combatants". Or the concerted effort by the White House to give telecommunications companies immunity after they spied indiscriminately on domestic US citizens, because of "national security". For that matter, look at the entire international community's refusal to do anything about the genocide in Darfur, despite an international legal requirement to stop genocide wherever it occurs, because it isn't personally convenient. Life imitating art, or art picking up themes developing in real life? I don't know. I wish they'd stop it, though.